The price of solar panels has recently fallen sharply. 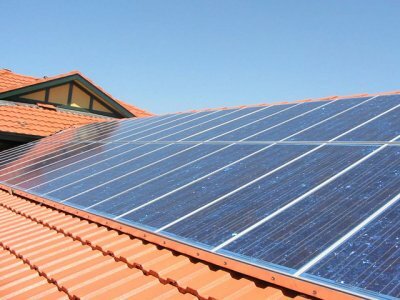 Does lower solar power costs now make it viable? Prices updated in 2014. Put together a solar power system design here. See the total parts list and costs based on average prices of multiple manufacturers. Choose the quatity and size of solar panels required. Use the table on the right to select a grid inverter large enough for the solar output. and tilted south in the northern hemisphere. The pitch angle should match you latitude. The ideal aspect and pitch is not always possible. The solar mounts assume the solar panels are directly bolted to the roof. DC power cables are needed between the solar panels and to the grid inverter. AC power cables are needed from the grid inverter to the power distribution box. Select a voltage level for the solar panels wiring, regulator, inverter and batteries. Pick a regulator with sufficient current capacity for the solar panel output. Battery size will be dependant on expected power input, power output and budget. DC UV power cables are needed between the solar panels and regulator. DC internal cables are needed between the regulator and batteries. DC internal cables are needed between the batteries and inverter. A ground cable is needed for the inverter. See what deductions can be made to the capital cost of a solar power system. Each Credit was initially worth $40. At Aug 2011 they were worth $26 each. Check solar panel pricing for different sizes and manufacturers. Dollars per solar watt are currently lowest for 80, 120 and 190 watt solar panels. Look for Maximum Power Point Tracking for grid inverters and regulators to acheive maximum efficiencies across various solar conditions. Battery arrays come in various individual battery voltage formats. Compare maintenance and servicing needs. To further improve solar panels performance consider Solar Tracking Mounting Systems. These system follow the sun through the day.